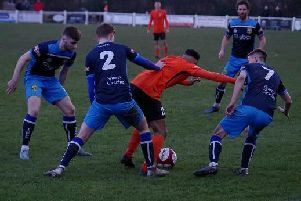 Tadcaster Albion lost at home in the league for just the second time this season as struggling Skelmersdale United left the i2i Stadium with a shock victory. The Brewers created plenty of chances in Saturday’s Evo-Stik Division One North clash but their failure to take them allowed the Lancastrians to secure their first away win of the campaign and climb out of the relegation zone. Albion manager Michael Morton named an unchanged starting line-up to the one that drew at Colwyn Bay in their previous outing, but did re-introduce under-21s ace Casey Stewart to the bench. Taddy started the contest brightly despite the fierce winds of Storm Brian, and Josh Greening was kept out twice by United stopper Lee Callum Roberts inside the opening five minutes. But it was the visitors who broke the deadlock in the seventh minute when Alastar Redmayne’s low strike from the edge of the area took a nick off Josh Barrett and found the bottom corner. The chances kept coming for the home team though and Greening was denied by gloveman Roberts for a third time after cleverly cryuff-flicking goalwards. Just two minutes later, another golden opportunity to draw level came and went for the home side. Lawrence Hunter’s swirling free-kick was knocked down by Tom Corner into the path of Andy Milne who only had the goalkeeper to beat, but the Brewers skipper fired straight at Roberts. Josh Barrett and Corner both saw volleys flash off target, while at the other end, Redmayne’s goal aside, Skelmersdale failed to trouble Greg Hartley. All the noteworthy chances came in the first fifteen minutes apart from when Aiden Savory headed narrowly off target in the final stages of the half. In the second period, Taddy enjoyed plenty of possession, but clear chances were not forthcoming. Albion delivered a hefty number of crosses into the box for Corner and Savory, but Skem defenders Liam Hollett and Callum Jones remained resolute. Morton’s men kept plucking away, however, and did equalise 20 minutes into the second half. Jones’ clearance cannoned off Pete Davidson and the Tadcaster midfielder continued to chase the ball with great intent, forcing goalkeeper Roberts into a scuffed clearance. The ball bobbled straight to Greening who remained ice cold as he jinked inside and deftly chipped over the custodian’s head. Albion continued to pen United in their own half after the leveller, but despite them dominating the ball and looking the most likely to score, it was infact the visitors who netted a decisive third goal of the game. Rob Bourne threaded a pass through to Andrew Owens, who was a handful all afternoon, and after the Skem forward scuffed his initial shot against a post he latched onto the loose ball to tap in as Chris Howarth failed to clear. There were still 15 minutes remaining for the hosts to get back into the match, the only real opportunity came when Roberts dropped a Savory cross and Milne went for the ball in but couldn’t manage to turn it on target.